Editor’s Note: Birgit has been a friend of HeroPress since it’s very beginning. Through the oddities of life she was never able to do an essay. Recently she told me she would have one soon. This is not that essay. Our contributor this week needed some extra time and Birgit said she had something she wanted to write about, so here it is. Many thanks Birgit. Something is in the air. Do you feel the WordPress vibrations? It’s shortly before the fifth WordCamp Europe which will be held in Paris this year. The social channels like Twitter & Co. are flooded with pre-event messages. You can feel the emotions of excitement and sadness in the timeline nearby. People share their excitement about their upcoming attendance and others who can’t make it. I am a person who belongs to both groups. But let me begin some months ago to tell you how this came to be. After WordCamp Europe in Vienna last summer I purchased my ticket for WCEU 2017 in Paris directly after the ticket sale was opened. There was no doubt at all I would participate. How life’s play changes, it worked out differently than planned. I’ve struggled with some health issues over several years. Mostly caused by stress during and after the divorce, as well as some deaths in the vicinity. Nothing really serious, but not ignorable. I thought… But at the end of the summer last year I got seriously ill. Not the right place for details here, but I had to quit my day job in a small agency because the fixed-term employment contract ended at the same time. Also, I had to reduce any contributions to the WordPress project. I had to reduce my freelancing contracts, too. I ran from one medical specialist to the other to find the cause of my illness. I was so frustrated not to be able to work like I’ve done before and so upset about the brain-fog and the fatigue. It was so depressing. As a mom of five children, it is not funny to be ill. The three youngest kids are living at home with me and my new partner. My oldest daughter bought her own house. But I couldn’t help her while moving. Can you imagine, how frustrating this could be? But hey – I am a fighter like a lioness. I put everything on the plate, invested my small savings into healing treatments and so on. To make a long story short, I am getting healthier every day. We found the cause and the healing treatments are helping like expected. Two operations went well. It is a process, but it’s going forward. Sitting at home without a job is not my thing, so I searched for a new day job. I found a part-time employment in my hometown as a head of a tutoring institute. It is ok, but nothing WordPress related. It secures my existence. But my saving balance allowed no budget for WordCamp travels. I gave up thoughts of attending WordCamp Europe in Paris this year. So I decided to offer my ticket. The unexpected miracle happened. I found sponsors for travel & stay without active seeking. My generous sponsors rewarded my past contributions to WordPress and Community over several years with this openhearted support. I am so grateful for this. Since 2012 I have been an active member of the WordPress Community. First as the main responsible person for the translations of WordPress into German, then as a part of the international Polyglots team. I am also editor and release manager for local German site and I am a member of some other contribution teams in the WordPress ecosystem. I spent a lot of spare time and money on contributions and WordCamp travels. Perhaps you can imagine how frustrating it was, that I couldn’t afford to travel to WordCamp Europe. An event where I can meet a lot of friends I made over the last years. Even more, I was happy to get the generous sponsoring. I am so grateful! In the last two years I had to reduce my contribution time and disappeared from the scene, but I followed the changes and enhancements within the community in the background. Nevertheless I wasn’t forgotten. Today is a completely different day. Largely thanks to @jdevalk (and team @yoast ) I WILL be attending. Beyond grateful is what I am. Everyone has had some downs and some ups. If you ask, there is always someone who is willing to help you. It is an example of a mindset from an open-source community like the WordPress community and it reflects the philosophy. You can get everything, but you have to ask. Only speaking people can be helped. I have a dream over some years to contribute to WordPress in full-time as a WordPress Community Manager. There are so many things I can do even if I am not a full-stack developer. Perhaps this miracle happens, too. But at this moment I am sitting on my suitcases to write about the generosity in the WordPress Community. This essay wasn’t planned, but it happened to have been written. I am so grateful for my heroes who made it happen, that I can go to the WordCamp Europe this year. There are so many unseen heroes outside who need to be seen. Be open minded, trust yourself and talk about what matters to you. There is a light at the end of the tunnel. Be your own hero. Beyond everything else: Care about yourself! 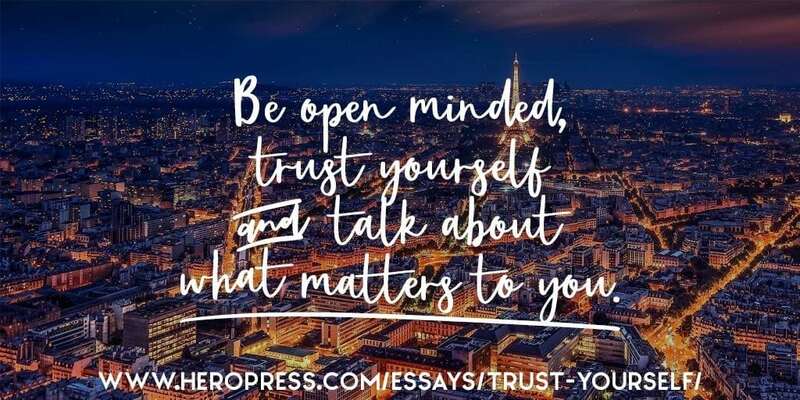 The post Trust Yourself appeared first on HeroPress.